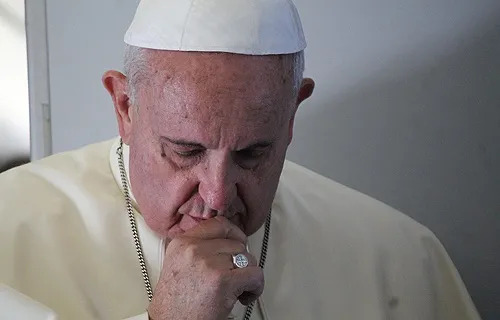 Vatican City, Nov 30, 2014 / 05:47 pm (CNA/EWTN News).- On his in-flight press conference returning from a three-day trip to Turkey, Pope Francis said that Muslim leaders around the world must speak out against violence and terrorism carried out in the name of Islam. “I believe sincerely that it can’t be said that all Muslims are terrorists. You can’t say that. Just as you can’t say that all Christians are fundamentalists because we have them too, eh. In all religions, there are these little groups,” he said Nov. 30. The Pope also offered a firm warning on the situation of Middle East Christians. He cautioned that while humanity has discovered the positive good of nuclear energy, it has also used this energy for destructive means. Asked about his trip to Turkey, Pope Francis emphasized ecumenism. He spoke about the importance of dialogue based on shared experience. The Holy Father voiced his conviction that Catholics are moving forward in their relationship with the Orthodox, who have both the sacraments and apostolic succession. “Unity is a journey we must undertake together,” praying and working together, he said, also noting “ecumenism of the blood,” as both Catholic and Orthodox martyrs shed their blood for the Christian faith. In addition, Pope Francis spoke about a particularly intense moment of prayer he had during the papal trip. He also spoke about his visit with refugee children and said that he would like to go to Iraq. “For the moment it isn’t possible. It’s not that I don’t want to go, but if I went right now it would cause a quite serious problem for the authorities, for security. But, I would really like to and I want to,” he said.